Our Alleviate Collection is designed to engage multiple senses to help you find relief from headache pain relieving the tension that can cause headaches. Using each of these products as a system will help you reach your wellness goals quicker with lasting results. 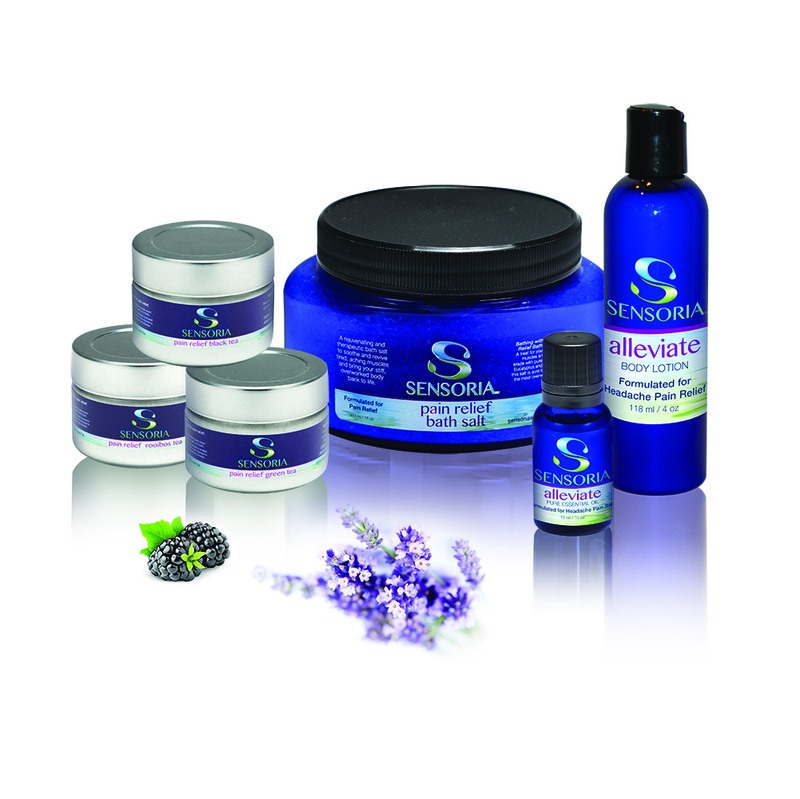 Continue to breathe, drink, soak and absorb Sensoria's Alleviate collection to follow your natural path to wellness. This blend of oils contains our Alleviate Essential Oils: An Aromatherapy Blend of oils designed and crafted to ease headache pain while at the same time, calming and relaxing your body. We use 100% Pure Undiluted Essential Oils. Essentials oils used in this blend include: Lavender, Peppermint and Frankincense. Our Alleviate Essential Oil Blend is a blend of pure undiluted essential oils. Massage: Combine 97.5% of carrier base oil with 2.5% of the Alleviate Essential Oil Blend (approximately 7 to 8 drops to 1 tablespoon or 15ml). Soothing Bath: Using the included essential oil dropper, add 5 to 6 drops of the Alleviate Essential Oil Blend to a warm bath. Agitate the water to disperse essential oil. Tea Preparation: Fill a Tea Leaf Infuser with our Pain relieving teas and steep in one 6 ounce cup of hot water until desired strength. Help soothe your throbbing head. Soak in a relaxing bath formulated to soothe your head. Pain Relief Bath Salts: Pure Epson Salt scented with Eucalyptus and Peppermint Essential Oils. Rejuvenating Bath: Pour a large handful of Pain Relief Bath Salts into a running bath and soak. Therapy Bath: Pour two large handfuls of Pain Relief Bath Salts into a running bath and soak for 20 minutes. This formula was designed especially to target and relieve headache pain. Massage into your temples, shoulders and arms to start easing headache pain.